A great way to create an engaging learning experience for your audience is to include audio narration with your explanatory text and visuals. You could narrate the entire course, or use audio for character scenarios only, or include first-person accounts from learners or subject matter experts (SMEs). 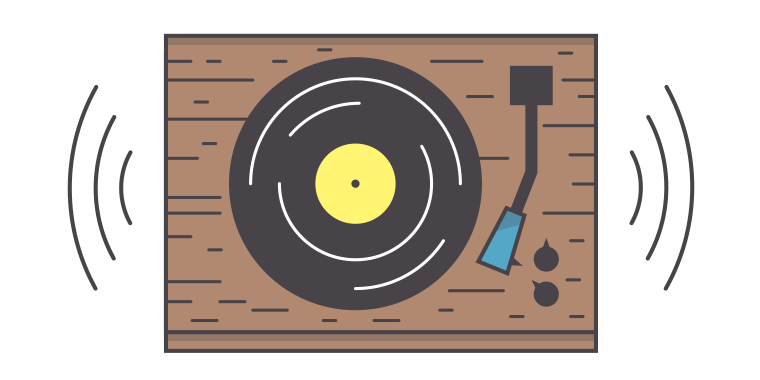 The good news is, today’s e-learning tools make it easier than ever to add audio to your online courses. Let’s look at some basic tips for preparing and recording high-quality audio narration. When you’re building your narration script, it’s usually a good idea to move the narration text out of your PowerPoint document and into a table-formatted Word document, where you can quickly see and read only the text that needs to be recorded. Otherwise, in PowerPoint, your narration text is in each slide’s notes panel, where it’s harder to locate as you record. Slide number - Slide numbers help you know which text goes with each slide. It’s also helpful for editing your audio after recording. Narration text - This is the actual text you’re recording. Sometimes this is different from the course storyboard. Narration notes - Notes provide direction for the narrator on how to read the script. They can include pronunciation guides, tips for emphasis, and narration pacing. With audio equipment, you really do get what you pay for. If you’re going to record audio on a regular basis, and are looking for medium- or high-quality result, be prepared to invest in a good microphone. There are many different types of microphones out there, but the two most common types are omnidirectional and unidirectional. Each has its strengths and weaknesses, and the right one will depend on the type of recording you want to do. An omnidirectional microphone picks up sound from all directions. It’s great for capturing ambient sounds, outdoor sounds, on-the-scene sounds, and speakers in a large room. It works best for situations where you don’t have a specific or target audio source, or when you need to capture a scene or an environment’s audio sounds. 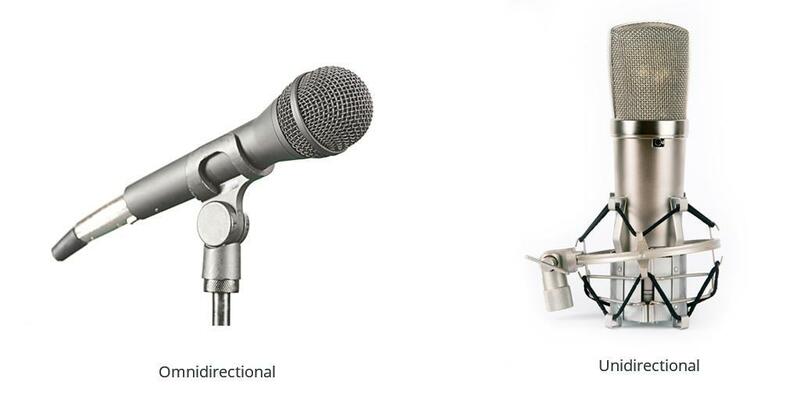 A unidirectional microphone only records audio sounds from one direction (typically, the front), so it is usually the best type to use for audio narration. These tend to do a better job of minimizing ambient or background sounds that might distract from the actual spoken words. 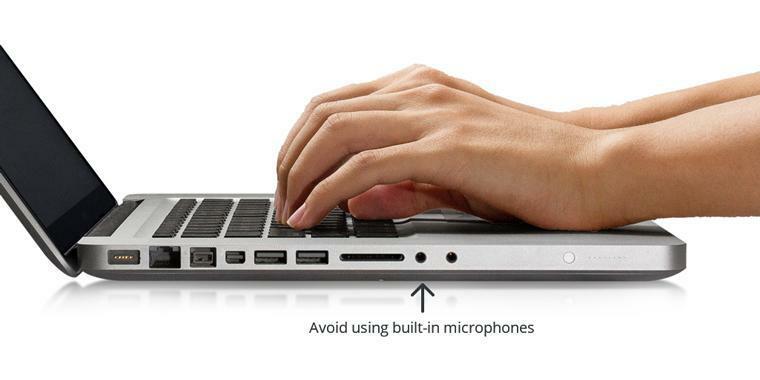 Whenever possible, avoid using your computer’s built-in microphones. They tend to pick up too much noise from the computer’s fans, hard drives, and system sounds. They’re not made for audio narration and should only be used to capture interviews or informal conversations, such as meetings with clients and SMEs. With either type of microphone, you have a few options to sharpen the quality of sound you capture. 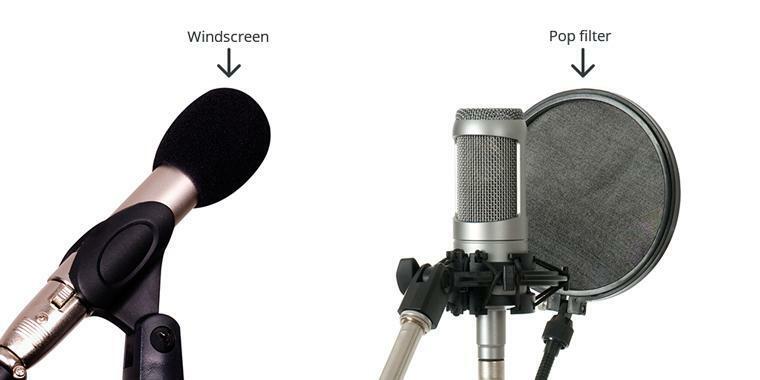 Pop filters help reduce popping sounds on “p” and “b” sounds by adding a layer of protection to the microphone. They can also minimize unwanted breath sounds that happen when you exhale too close to the microphone. Most pop filters cost less than $20, though you can also make your own really easily. Simply wrap nylon stockings around a clothes hanger and place it in front of the microphone before you start recording. Windscreens filter more sound and can even help reduce background ambient noise. Like pop screens, you can generally find a windscreen for $20 or less. When you’re recording in a professional studio, the walls, floors, and overall room acoustics are specially insulated to cancel unwanted ambient noises. 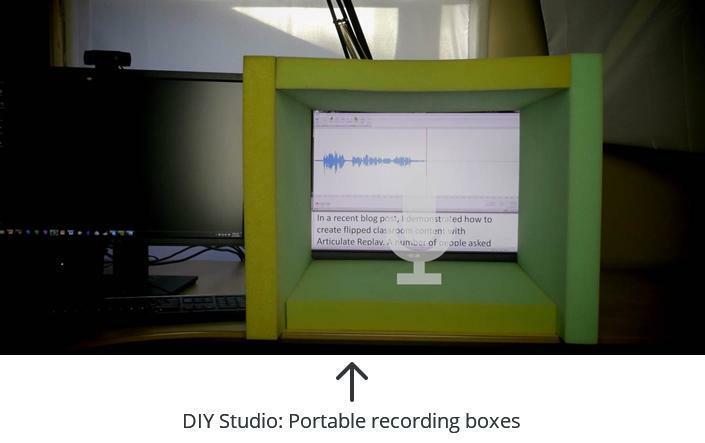 Since this type of setup is neither affordable nor portable for the average e-learning designer, many users have started building their own recording studio boxes. Using something as simple as foam seat cushions, you can pull together a portable recording box that encases your microphone. It cancels out a large portion of ambient noise and gives you a quick bump in audio quality. For more information about portable studio boxes, check out this blog post by Mike Enders. Recording room. Your room’s layout, wall treatment, and furniture can affect the quality of your recordings. A carpeted room with furniture will sound different than an empty room with wood flooring. When possible, designate a particular room as your recording room and use it for the duration of your recording project. Microphones. Use the same microphone each time you record. It’s not uncommon to have a couple of microphones, but you should really use the same microphone each time. Microphones have “personalities,” and changing mics can change your audio quality. Microphone stands. Mic stands come in both desktop and floor models, and really help capture clean and consistent audio recordings. Depending on the microphone you use, the distance between the microphone and your mouth will vary. Find the ideal distance and note that in your recording settings. Capture your recording settings. Whether you’re sharing a recording setup with co-workers or going it alone, you should always capture the important settings used for your recordings so they are consistent over time. This can include your input levels, microphone settings, and any other audio settings you’re working with. An easy way to capture settings is to take a picture or screenshot of them. Your goal is not to remove all sounds, but to minimize as many ambient sounds as possible. That said, it’s nearly impossible to muffle all the sounds in a room, even in a professional studio. Turn off your air conditioning. While this is easier said than done in summer, but keep in mind that air conditioning is responsible for most of the noise in your office. Place your computer under your desk. Computer fans and hard drives produce a lot of noise. The more distance you can put between your computer and your microphone, the quieter your room will be. Disconnect unused computers, printers, and external hard drives. The fewer devices you have running the better. Dampen room noise. Even if you don’t have sound-dampening material on the walls like in a professional studio, you can make a big dent in ambient noise with carpet, window treatments, furniture, and any other materials that absorb sound. Your room is set up and you’re ready to record, right? Almost. There are still a few pre-recording things you should do before you jump into your first official take. This is one of the most important things you can do when recording. If the levels are too high, you’ll pick up cracks, pops, and other digital artifacts. Levels that are too low will be difficult to hear in the published course. To help you get consistent audio across recording sessions, let me tell you a little more about audio levels. A general rule of thumb is to keep your input levels between -12db and -6db. Since you’re recording digitally, you’ll find all audio recording programs make it easy to identify the ideal levels. Notice how the levels are between -12 and -6? That leaves enough room for louder sounds without the risk of clipping. Depending on the audio program you’re using, your input levels should be in the yellow range when you’re recording at normal speaking levels. After you’ve verified your input levels, you’ll want to record a short piece of test audio. Because, no matter how many times you perfect your settings, other recording issues can occur unexpectedly. Maybe an audio setting gets changed accidentally, or your voice doesn’t project as loudly as it did the first time, or you encounter a hardware issue. It happens. So always take the time to record at least 30 seconds of test audio before you actually jump into your script recording. Headphones isolate ambient noise and help you hear your recorded audio clearly. Because they’re worn over the ears, you get the closest, most realistic playback of your audio. Most users will listen to your courses with headphones—especially those in corporate or academic settings—so you’ll want to hear exactly what your learners hear. For optimal consistency in your recording, you should endeavor to record your script in a single session. Even when you control your recording environment, your voice can sound different. If you have to record pickup audio (i.e., re-record some audio), record the full paragraph or slide rather than only the single word or phrase. Recording nuances in your voice will be less obvious when you re-record larger blocks of text. That said, the more you can do in one session, the better. You’ll have more control over the small but noticeable recording variables that contribute to a consistent sound. There’s always more to learn about vocal techniques and creative ways to incorporate audio into your online training. But now that you have a basic understanding of audio recording for e-learning, you’re well-equipped to record your next project like a pro. What a great article. I especially appreciate the tip about getting a pop filter. I'll do that! Thank you for sharing your great information about recording. Great article! I'm a musician and an audio engineer in my very little spare time so I tend to go overboard sometimes. (I use a condenser microphone into a mixing board so that I can EQ and apply effects to the mix before I go out to my recording tool.) One thing that I might add to this discussion is that you may want to record your audio to a little more high powered tool. Audacity is a great little freeware audio tool that can give you a ton of editing options that you just won't find in your audio tools packaged in eLearning programs. That said, Storyline has one of the better voice over/audio tools that I've found. Results on playback sound quite similar to the audio that comes out of the mixer for me. Others I've used I'm quite shocked at the drop in audio quality from the mix to the eLearning development tool. Are people recording in their office setting? It is impossible to reduce the ambient noise, we cannot turn off heat or air. I try to get permission to record at home but this is not always allowed. Also do you recommend recording within Presenter or recording using other software and then importing the audio files.